United Nations, 5 May 2017 — The United Nations Permanent Forum on Indigenous Issues concludes its 16th session today with the adoption of a report including recommendations for States, UN bodies and indigenous peoples. The Forum pointed out progress in realizing the rights of indigenous peoples since the adoption of the UN Declaration on the Rights of Indigenous Peoples ten years ago, but also voiced serious concerns about lack of implementation in many countries and emphasized the need for concrete action at the national and local levels. 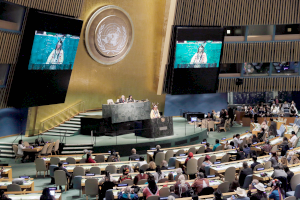 More than 1,000 indigenous peoples’ representatives attended the session from 24 April to 5 May 2017 at UN Headquarters in New York. The main theme of the Session was the 10th anniversary of the UN Declaration on the Rights of Indigenous Peoples, adopted in 2007. The Permanent Forum also discussed follow-up to the World Conference on Indigenous Peoples (2014), Implementation of the 2030 Agenda, the situation of indigenous human rights defenders and the empowerment of indigenous women and youth. Despite the advances, “progress has been far too slow; much more needs to be done,” said the Chairperson. Alarming numbers of indigenous peoples experience encroachment on their traditional lands and territories, displacement and dispossession as well as harassment, threats and killing of indigenous human rights defenders. Adequate consultative mechanisms by Governments and the private sector, respect for indigenous lands and territories, and protection of indigenous human rights defenders are among the most pressing demands made by indigenous peoples’ representatives at the Session. Since the establishment of the Permanent Forum, its annual sessions have fostered dialogue and cooperation between indigenous peoples and Member States. At its closing, the Permanent Forum called for concrete actions and commitments to achieve the UN Declaration on the Rights of Indigenous Peoples in spirit and in practice. The rapporteur’s advance, unedited version of the report of the 16th session is available below, with the official document expected in June. The report will be presented to the Economic and Social Council in July 2017. For more information, please see www.un.org/indigenous.